Updated April 2003 - changes will be reflected in new edition of Flag Etiquette publication. The National Flag of Canada should be displayed only in a manner befitting this important national symbol; it should not be subjected to indignity or displayed in a position inferior to any other flag or ensign. The National Flag always takes precedence over all other national flags when flown in Canada. The only flags to which precedence is given over the Canadian flag are the personal standards of members of the Royal Family and of Her Majesty's eleven representatives in Canada (i.e. The Governor General and 10 Lieutenant Governors). The National Flag of Canada should not be used as table/seat cover, as a masking for boxes or as a barrier on a dais or platform. While it is not technically incorrect to use the National Flag of Canada to cover a statue, monument or plaque for an unveiling ceremony, it is not common practice to do so and should be discouraged. Nothing should be pinned to or sewn on the National Flag of Canada. The National Flag of Canada should not be signed or marked in any way (A border could be attached to the outside edge of the Flag on which it would be acceptable to have signatures leaving the Flag itself untouched). When the National Flag of Canada is raised or lowered, or when it is carried past in a parade or review, all present should face the flag, men should remove their hats, and all should remain silent. Those in uniform should salute. The National Flag is flown at all federal government buildings, airports, and military bases and establishments within and outside Canada. The flag may be flown by night as well as by day. If hung horizontally, the upper part of the leaf should be up and the stem down. If hung vertically, the flag should be placed so that the upper part of the leaf points to the left and the stem to the right from the point of view of the observer facing the flag. Flags hung vertically should be hung so that the canton is in the upper left corner (Figure 4). The top left (first) quarter or canton should be placed in the position nearest the top of the flagpole or mast. When carried, the guidelines listed under "Dignity of the Flag" should be respected. The canton should be placed uppermost, raised as closely as possible to the top with the flag rope tight. The upper part of the leaf should face the north in an east-west street (Figure 5), and face east in a north-south street (Figure 6), thus being on the left of the observer facing east or south respectively. Displayed horizontally or at an angle from a window or balcony, the canton must point outward. The flag must be on a pole firmly fixed to the chassis on the front right. When only three flags are displayed, the National Flag should be at the centre. To an observer facing the display, the second-ranking flag (in order of precedence) is placed to the left of centre, and the other to the right. A common combination of flags is that of the National Flag of Canada with a provincial or territorial flag, and a municipal flag or an organization's banner. In such a case, the National Flag should be in the centre with the provincial/territorial flag to the left and the municipal flag/organization's banner to the right (to an observer facing the display). The canton should be draped over the upper left corner of the casket (Figure 7). The flag should be removed before the casket is lowered into the grave or, at a crematorium, after the service. The flag size for a standard adult-sized casket should be 4 1/2 X 9 feet/ 1.40 X 2.80m. Due consideration should be given to flag etiquette and precedence whenever the National Flag of Canada or other sovereign national flags or provincial/territorial flags are displayed. If one simply wishes to create a decorative effect (e.g. dressing a house for a festive occasion) it is preferable to use pennants or coloured buntings and not flags. When the National Flag of Canada is flown alone on top of or in front of a building where there are two flagpoles, it should be flown on the flagpole to the left to an observer facing the flag. When the National Flag of Canada is flown alone on top of or in front of a building where there are more than two flagpoles, it should be flown as near as possible to the centre (Figure 8). When the National Flag of Canada is displayed in a place of worship or on a speaker's platform, it should be against the wall, or on a flagpole on the left from the point of view of the congregation audience facing the celebrant or speaker (Figure 9). When used in the body of a place of worship or auditorium, the National Flag of Canada should be to the right of the congregation or spectators facing the flag (Figure 10). The National Flag of Canada, when flown or paraded, takes precedence over all other national flags. 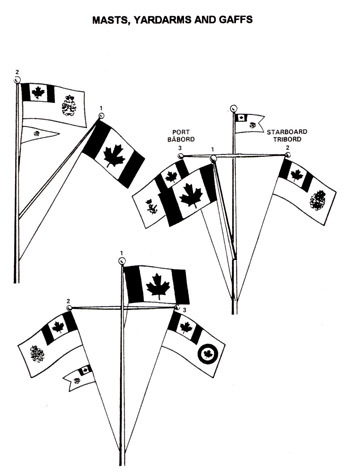 When flown with the flags of other sovereign nations, all flags should be flown on separate flagpoles/masts and at the same height, all being of the same size, with the National Flag of Canada occupying the position of honour. The National Flag should be raised first and lowered last, unless the number of flags permits their being raised and lowered simultaneously. With the flag of one other nation, the National Flag of Canada should be on the left of the observer facing the flags; both should be at the same height (Figure 11). When crossed with a flag of another sovereign nation, the National Flag of Canada should be on the left of the observer facing the flags; the flagpole bearing the National Flag of Canada should be in front of the pole of the other flag (Figure 12). In a line of three flags, the National Flag of Canada should be in the centre. The other two flags should, in alphabetical order, be placed to the left and right of the National Flag respectively, from the point of view of the observer facing the three flagpoles/masts (Figure 13). When there are more than three flagpoles/masts, the National Flag of Canada should be flown on the left of the observer facing the flags, followed by the flags representing the other sovereign nations ordered alphabetically. An additional National Flag of Canada may also be flown on the right at the end of the line (Figure 14). In a semi-circle of flags representing a number of sovereign nations, the National Flag of Canada should be in the centre (Figure 15). In an enclosed circle of flags representing a number of sovereign nations, the National Flag of Canada should be flown on the flagpole/mast immediately opposite the main entrance to a building or arena (Figure 16). With a combination of flags of sovereign nations, provinces/territories, international organizations, cities, companies, etc. In keeping with previously outlined practice, the National Flag of Canada, when flown with different types of flags, should be flown on the left of an observer facing the flags. The position of the other flags is determined by order of precedence (Figure 17). When there are more than three flagpoles/masts, the National Flag of Canada should be flown on the left of the observer facing the flags, followed by the flags of the provinces and territories. An additional National Flag of Canada may be displayed at the end of the line if desired. If carried with other flags, in a single file, the National Flag of Canada should always lead (Figure 19). If carried in line abreast, it is preferable to have the National Flag of Canada at each end of the line (Figure 20). If only one National Flag of Canada is available, it should be placed in the centre of the line of flags carried abreast (Figure 21). Note: It is suggested that the pole or pike used to carry flags be 7 or 8 feet/ 2.10 to 2.40m in length. The National Flag of Canada is the proper national colours for all Canadian ships and boats, including pleasure craft. The Canadian Shipping Act states that a Canadian ship shall hoist the flag on a signal being made to her by one of Her Majesty's Canadian ships, or any ship in the service of and belonging to the Government of Canada; on entering or leaving any foreign port; and if of 50 tonnes gross tonnage or upwards, on entering or leaving any Commonwealth port. Foreign vessels may fly the Canadian flag as a "courtesy flag" when they are berthed in a Canadian port. The flag then is customarily flown from the foremast. in times of mourning, the flag may be flown at half-mast, which places the upper corner of the flag next to the staff at approximately three-quarters of full-hoist. As on land, a flag hoisted to or lowered from half-mast position must first be hauled close-up. The flag is brought to the half-mast position by first raising it to the top of the mast then immediately lowering it slowly to the half-mast position. The position of the flag when flying at half-mast will depend on the size of the flag and the length of the flagstaff. It must be lowered at least to a position recognizably "half-mast" to avoid the appearance of a flag which has accidentally fallen away from the top of the mast owing to a loose flag rope. A satisfactory position for half-masting is to place the centre of the flag exactly half-way down the staff (Figure 23). On occasions requiring that one flag be flown at half-mast, all flags flown together should also be flown at half-mast. Flags will only be half-masted on those flagpoles fitted with halyards and pulleys. Some buildings fly flags from horizontal or angled poles, without halyards, to which flags are permanently attached. Flags on these will not be half-masted. Her Majesty's Personal Canadian Flag, the standards of members of the Royal Family as well as the standard of the Governor General and the standard of the Lieutenant Governor (in his/her province of jurisdiction and when assuming the duties of the representative of The Queen) take precedence over the National Flag of Canada on the buildings where these dignitaries are in residence or where they are attending a function. There are exceptions when flying the Union Jack as outlined under the chapter entitled "The Royal Union Flag". For rules on flying historical flags along with the National Flag of Canada, consult the Historical Flag Policy and Rules for Flying Historical Flags in Canada for more information. The flag configurations shown in figures 11 to 16 also apply when the National Flag of Canada is flown with one or moreprovincial/territorial flag.